This holiday season, three indie polish makers have teamed up to create a limited edition holiday trio celebrating the three types of polishes that they each do best. Lacquer Lust has contributed a gorgeous holographic polish, Polished by KPT created a shimmering thermal, and Serum No. 5 came in strong with a glow in the dark! I think this is such a fun idea and a great collaboration. Ho Ho Holodays! by Lacquer Lust is a medium green linear holographic. It also has a wonderful golden flash that gives the polish that extra "oomph." You can see the gold best if you look around the edges of the light highlights on my nails in the photos below. Three coats, shown first in direct light and second in indirect light. It applied smoothly and evenly. 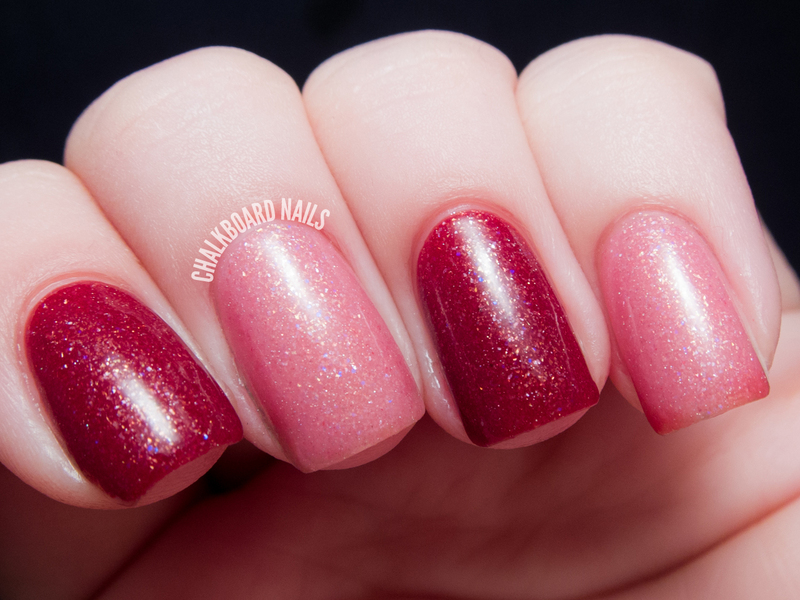 Naughty & Nice by Polished by KPT is a gorgeous thermal polish that changes from a blushing pink when warm to a cranberry red when cold. It is packed with golden shimmer and iridescent sparks. I was really pleased with this shade. Even when warm, the natural pink shade is opaque and shimmering. Three coats, no issues with application or formula. Shown first in direct light and second in indirect light. Yule Light Up My Life by Serum No. 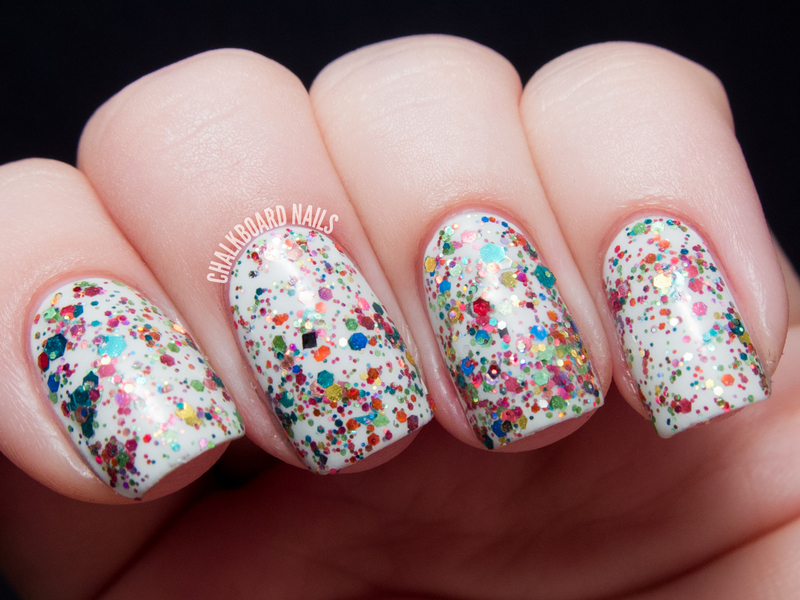 5 is a glow in the dark multicolor glitter topper. I've layered one coat here over OPI My Boyfriend Scales Walls. As you can see, it is positively packed with gorgeous metallic glitters in jewel tones. 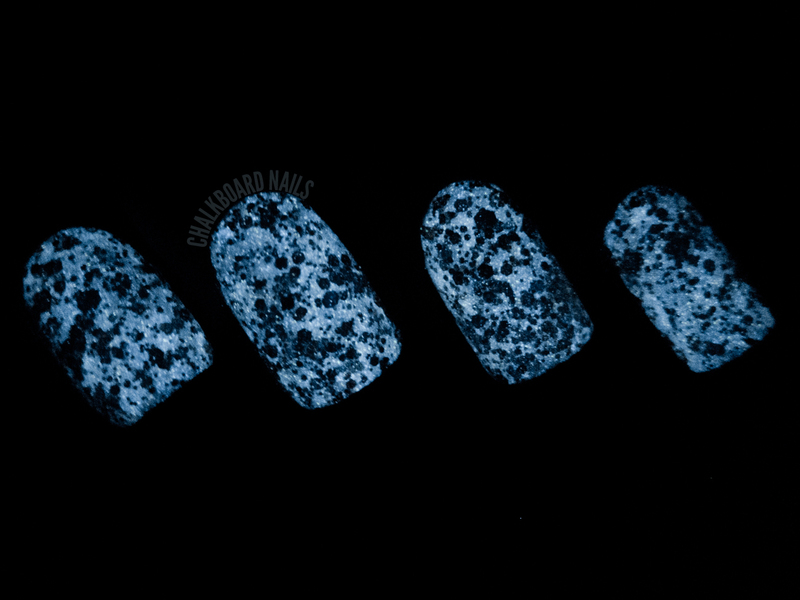 This polish also glows white in the dark, though my camera wanted it to look blue. You can increase the intensity of the glow by layering it over a light color, but this would work well as a glitter topper over any color, really! What do you think? I think this is a great, well rounded trio from three special ladies. I also think it would make a great gift for someone that wanted to be introduced to indie polish or polish with unique properties (like thermal, holo, and glow). This limited edition trio is only sold as a set of all three polishes. It is available for purchase in all three shops: Serum No. 5, Polished by KPT, and Lacquer Lust. Especially the thermal, it rocks so hard!